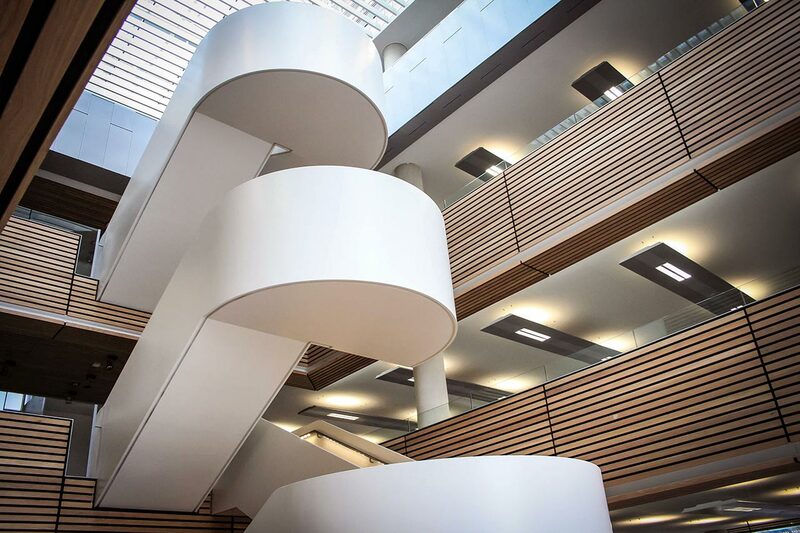 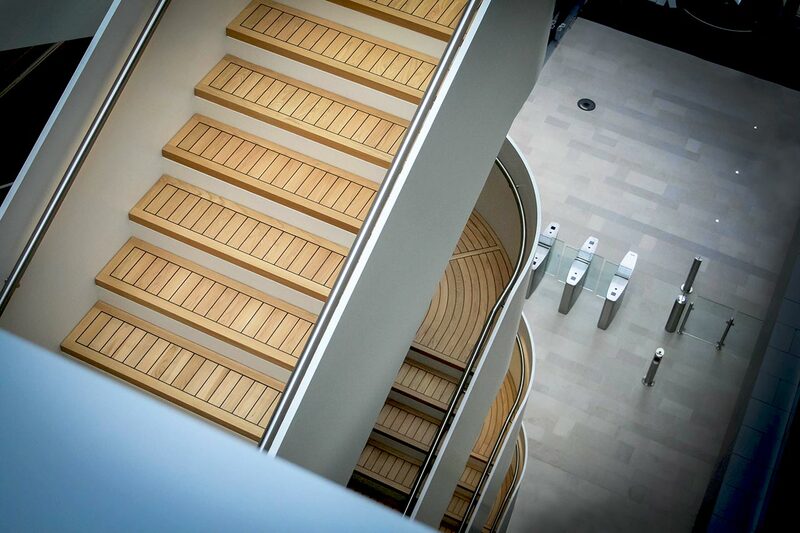 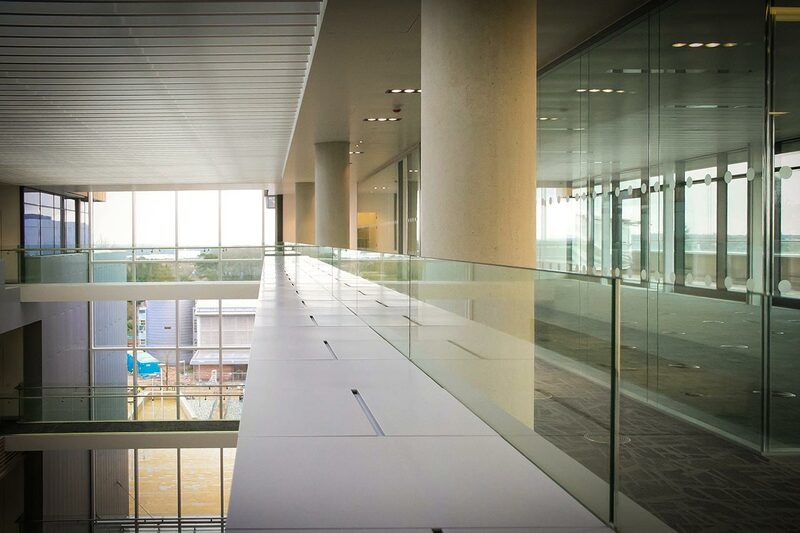 Littlehampton Welding were responsible for the feature staircases, glass bridges and a variety of balustrades in the atrium of the new state of the art Biomedical Sciences Building of Southampton University, a world leading centre for innovation, business and education. 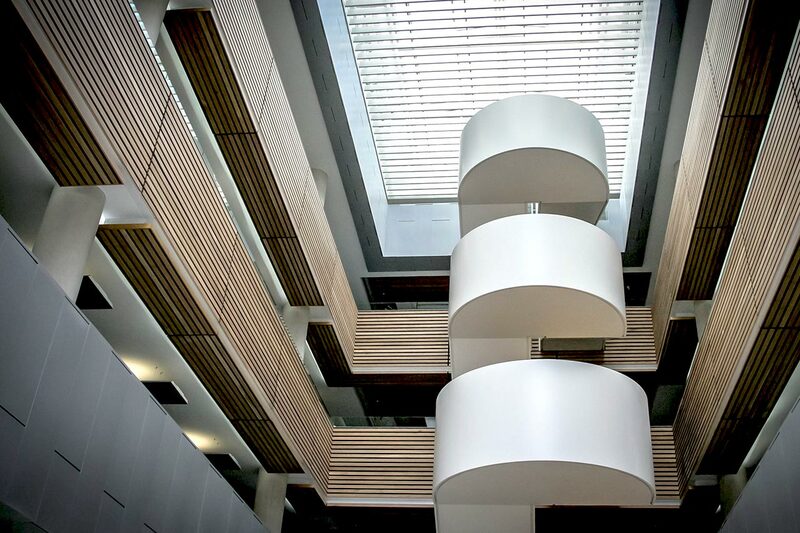 The main feature staircase ascends towards the large skylight of the atrium in a series of eight flights with integral, semi-circular landings between each floor. 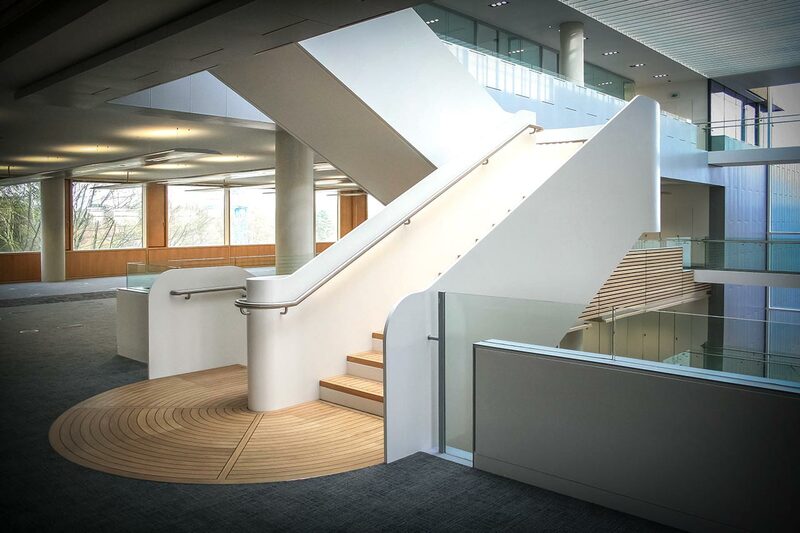 To form the stair’s balustrades the 30mm thick solid steel inner and outer stringers rise up to a height just above the tubular steel hand rail set on the inside. 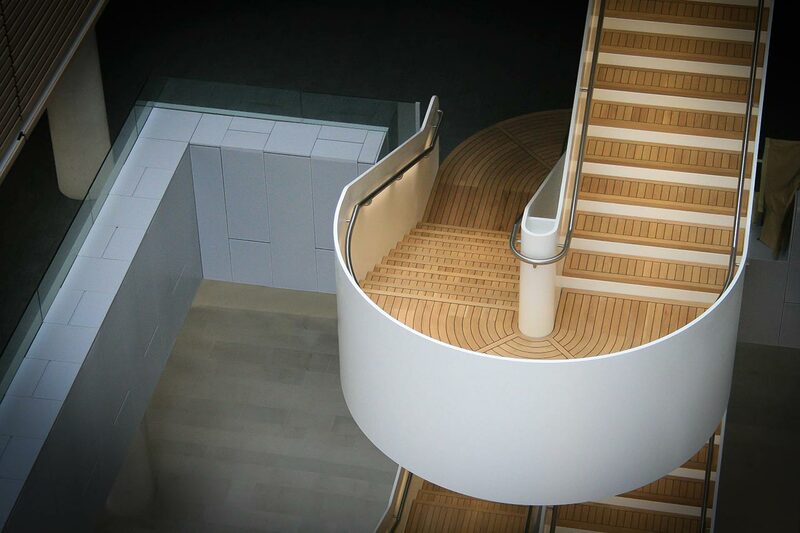 This means the stairs are partly enclosed and have an almost futuristic appearance being finished in a semi gloss Signal White. 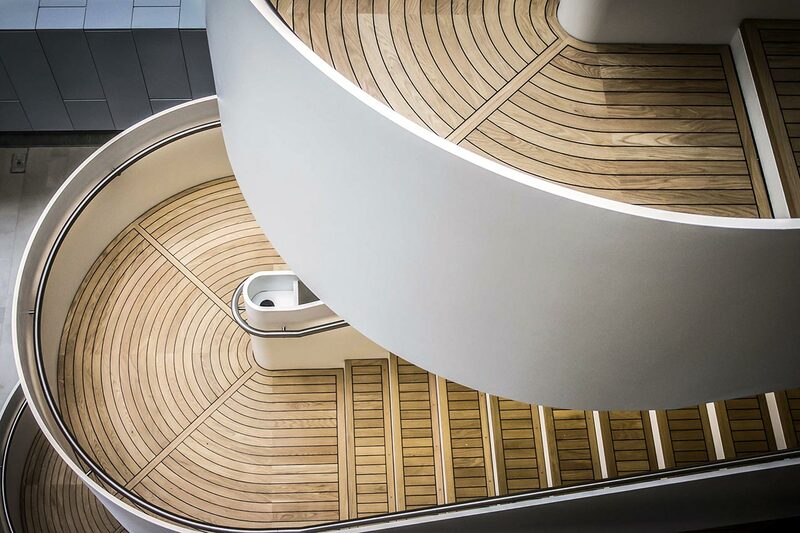 This beautiful, somewhat stark look is off-set by the warmth of the wood slats that top the steps and landings. 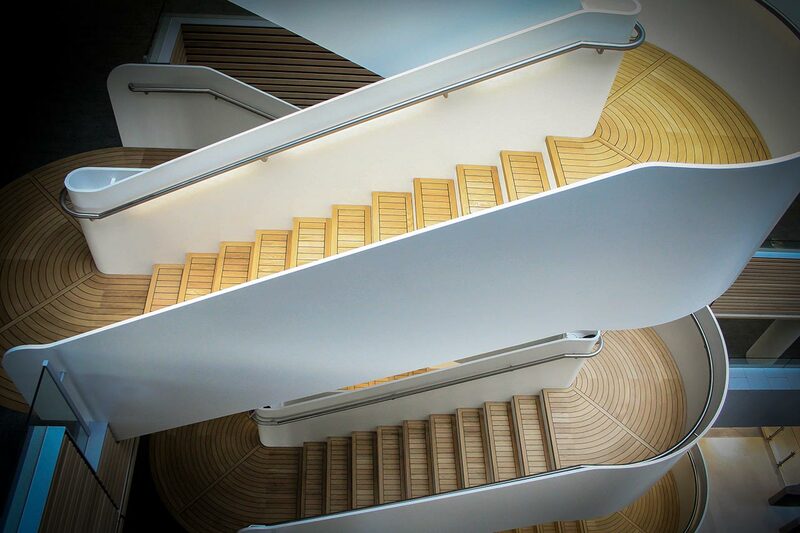 The treads were fabricated from 8mm thick mild steel and welded between the stringers. 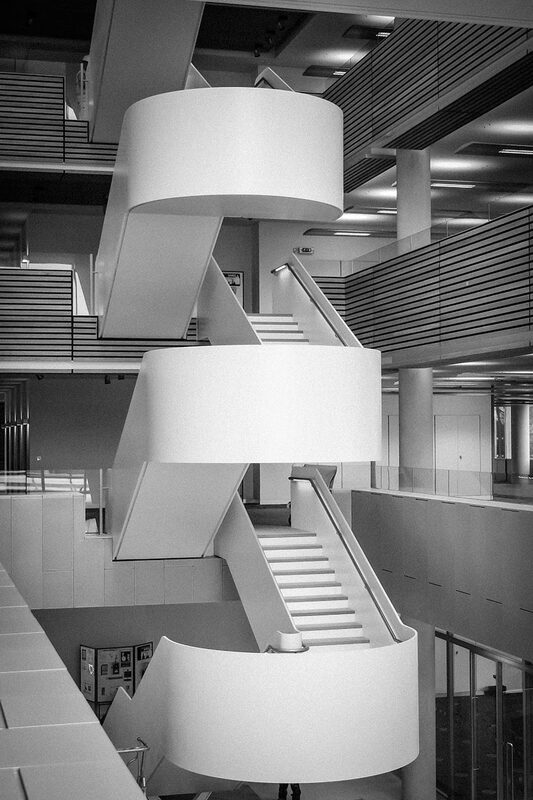 All mild steel parts were primed with a two component epoxy zinc phosphate/micaceous iron oxide primer. 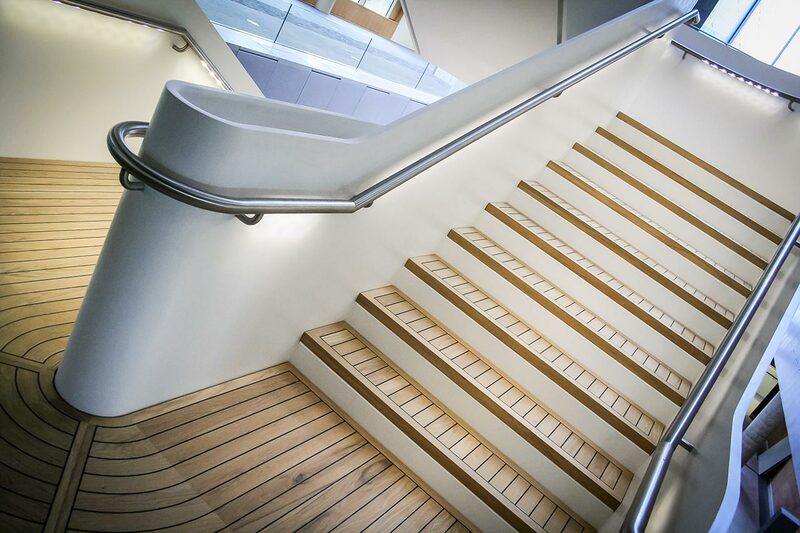 With the top coat being a two component, high build, high solids, surface tolerant epoxy coating. 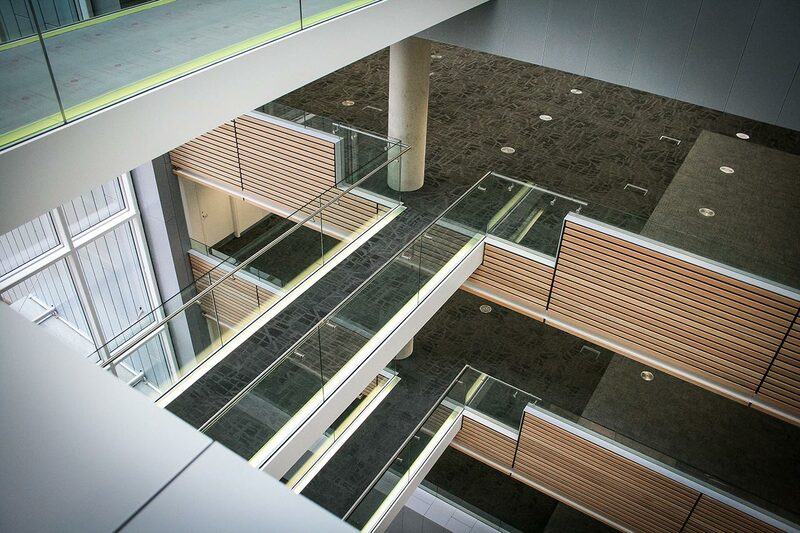 We also supplied and fitted glass balustrades and three bridges which span the 9 metre wide void of the atrium on floors four, five and six. 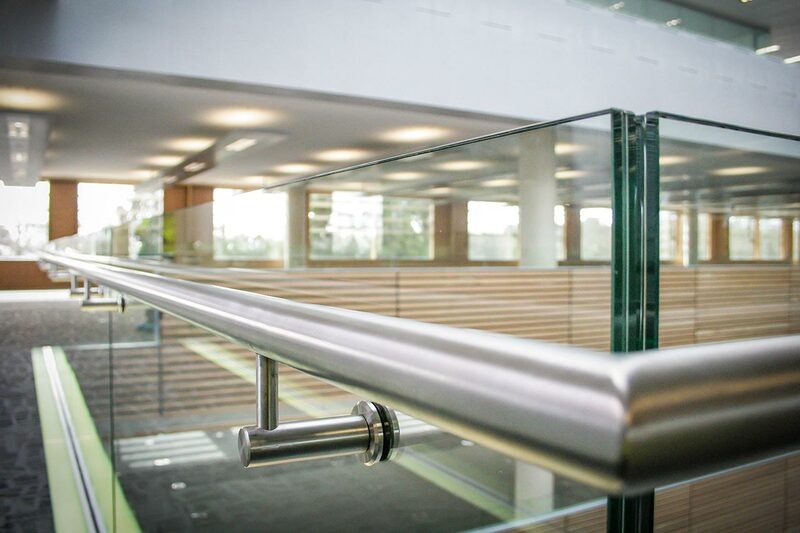 Again, tubular steel was used for the handrails – this time fitted directly onto the 17.5mm thick laminated glass balustrades with tubular right-angled brackets. 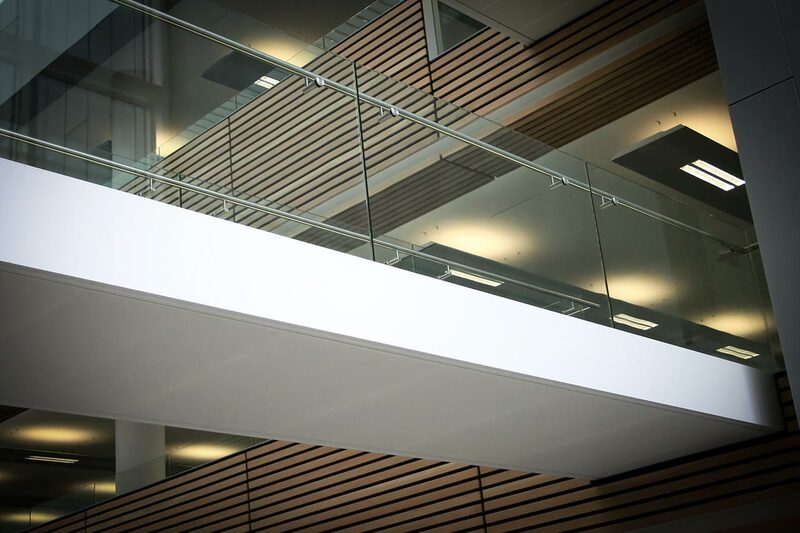 The glass itself was secured along the bottom edge within a fabricated mild steel channel; the top of the channel trimmed with 10mm thick polyester powder coated aluminium plates. 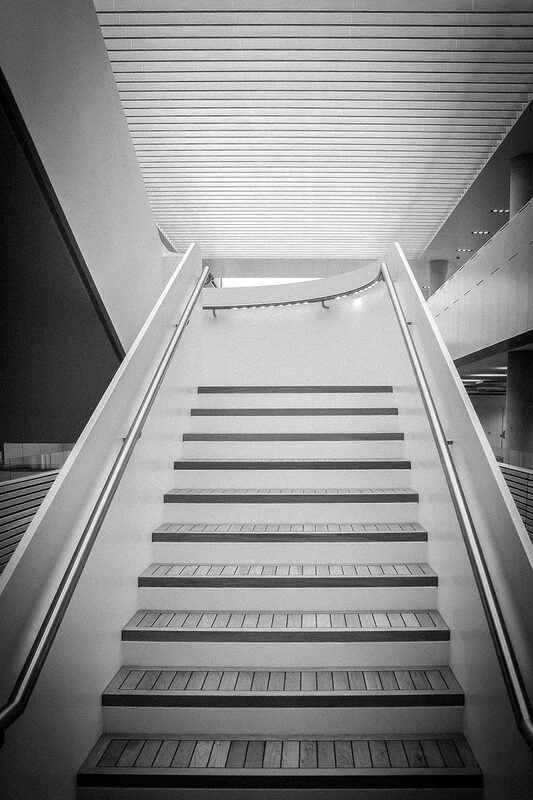 All mild steel parts were primed with a single component alkyd primer.